Composed by Tony McManus. Solos, Style, Boxed. Grossman Guitar Workshop. Celtic / Irish. DVD. Duration 94 minutes. Grossman's Guitar Workshop #GW960DVD. 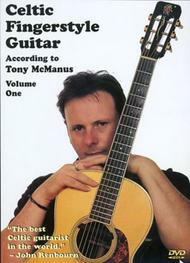 Published by Grossman's Guitar Workshop (MB.GW960DVD). Tony McManus is an adept master of Celtic fingerstyle guitar, both in terms of adapting Celtic music to the guitar, and in its performance- presenting all its intricacies, graces, and frills, yet at the same time maintaining the pace and drive which characterizes the style of this music. In this first lesson, Tony discusses in detail the importance of ornamentation and triplets in Celtic music and how they can be technically achieved. He illustrates these ideas with several melodies played in dropped D tuning. This is followed by a discussion of scales and fingerings and playing reels in the DADGAD tuning. This is a challenging lesson for the fingerstyle guitar student interested in learning Celtic music from one of the finest players of this idiom. A detailed tab/ music booklet is included as a PDF file on the DVD.